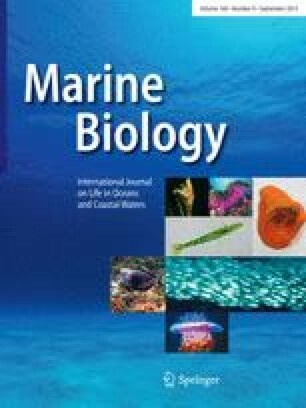 During a study of midwater fish feeding in the oligotrophic North Pacific gyre in August 1978, nine specimens of a tropical-subtropical myctophid, Ceratoscopelus warmingii, were found to have been feeding on mats of diatoms, Rhizosolenia spp. Chemical analyses of the intestinal contents of several additional specimens showed significantly elevated levels of diatom degradation products. Therefore, C. warmingii, although known to feed on zooplankton, appears to be adapted for occasional herbivory. Such an adaptation is exceptional within a major ecological group of oceanic fishes that was previously thought to be exclusively carnivorous. Like omnivorous and herbivorous fishes in general, C. warmingii has a longer intestine than other myctophid species. As an adaptive response to competition from a diverse fish fauna in a low-productivity environment, occasional herbivory by C. warmingii runs counter to the theoretical expectation by expanding rather than narrowing the range of potential food types.